Joystick - Repair Cost: $185. LCD Display - Repair Cost: $300. 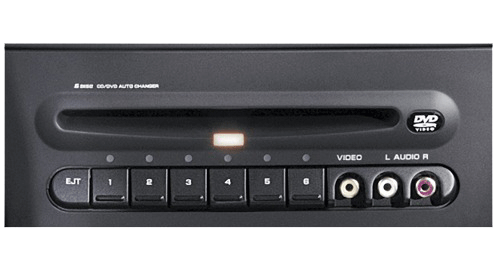 CD Changer - Repair Cost: $350. All other repairs - Repair Cost: $185. to $550. Repair Cost: $185. TO $550. Note: See bottom of this page for Specs, Compatibility, and Error Messages. Common Problem: No Eject, No Load, No play DVD. Note: If your DVD is stuck inside the unit, do not try to remove the disc. Most of the time the DVD mechanism gets damaged in the process and it would cost more to fix it. Common Problem: No Eject, No Load, No Play CD or Cassette. Repair Cost: $185. TO $275. Common Problem - No Load, No Play CD, No Eject. Common Problem - No display, Black screen, No touch response. Repair Cost: $185 to $345. Common Problem - DVD won't play. DVD stuck. Note: Please remove Discs from CD Changer prior shipping. Common Problem: No Load, No Eject, No play DVD. Supports English, French, Spanish for U.S.
From the Home Screen, enter, ECU View. Select Enable|Disable Front Seat Video. Select Enable or Disable as desired. The Gracenote ™ database will recognize 100,000 CDs, but it cannot recognize newly released CDs that came out after the database was installed. Future software updates will add to the database. The first update to the Gracenote database is due in late March 2008. For safety reasons, certain features such as video playback, parts of the address book, and the keyboard to enter information are locked out when the vehicle is in motion. Drivers can use the voice recognition feature, however. The Traffic Message Channel (TMC) is provided by SIRIUS ™; owners must have a valid subscription for it to work. For more information see Wikpedia's Traffic Message Channel page. For safety, some features (video playback, some parts of the address book, and the keyboard to enter information) are locked out when the vehicle is in motion. Drivers can use the voice recognition feature, however. The voice recognition system is designed to work with the windows up, the HVAC fan on Off or Low, and the user speaking in a normal tone. It will not work as well if the windows are down, the fan is on high, or if the driver speaks in low tones. If the voice recognition system has trouble understanding a user, he|she can train it using a short procedure. See the navigation Owner's Manual. The use of a StarSCAN to retrieve and change additional radio settings may be required. For example, if a vehicle's backup camera does not display, the radio may not know that the vehicle has a camera. Conversely, if the radio thinks there's a backup camera when there isn't, the screen may display static when the vehicle is put into reverse. Emergency eject of stuck discs - Homemade CD-Rs or DVD-Rs that were poorly formatted may confuse the system, causing the disc to become jammed. 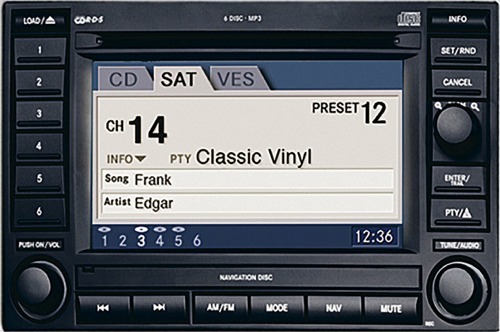 On radios with software version 9.041 or later, you can force the disc to eject using a combination of keys. First make sure the display is open. Then, for an RER radio, hold the NAV button while pressing SEEK UP and SEEK DOWN at the same time. For an REN radio, hold the AUDIO button while pressing SEEK UP and SEEK DOWN at the same time. If discs frequently jam, using high quality media and better burning software to create the discs may solve the problem. If the navigation system shows the wrong current location, use the Nav menu and make sure that the radio is receiving at least four satellites. Then drive the vehicle on main roads (which are more likely to be in the database) until the current location is correctly shown. This usually takes no more than 30 seconds, but it can require as long as 20 minutes. Once the current location is accurate, the problem should not reoccur unless the vehicle is transported while not operating (on a ferry, railroad car, transport truck, etc.). If it does reoccur, repeat the procedure. 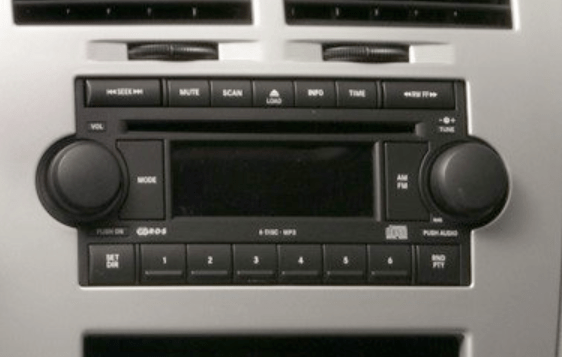 Owners who plug an external device such as an MP3 player into the AUX jack should remember that both volume controls, on the radio and on the device itself, will affect the sound level. - Press and hold the desired preset soft key on the right side of the display. - Keep holding the preset until the preset goes through a color change of green, then yellow. Once the selected preset turns yellow, the current station|frequency will be saved. 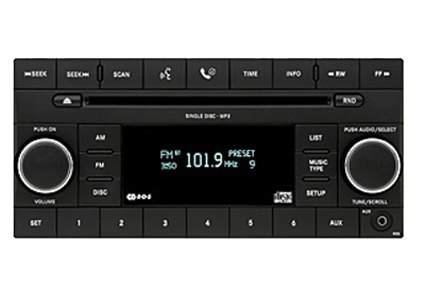 Note: Mopar IPOD kits - Satellite radio station presets are lost when switching from the IPOD mode to satellite radio mode. "Module Failure" message displays when trying to use satellite mode. Usually caused by an electrical short in the SDAR antenna, not the radio. This appears to be most common on Durango and Aspen. The SDAR antenna cable is usually the source of the problem. Check behind Driver's A-Pillar trim for possible pinched antenna cable and or loose and or bent pin at the back of the radio. 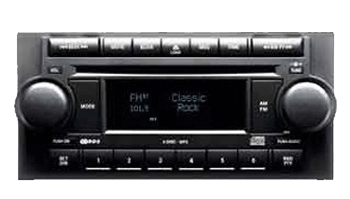 "Module failure" message does not indicate the need to replace the radio. "Tag Not Found" mesage displayed on navigation information page. 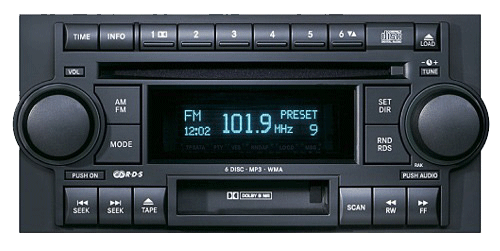 Critical error, radio must be replaced due to internal HDD failure. "Not applicaple|NA msg" message displayed in Gracenote area. Critical error, radio must be replaced (non-navigation REN models). "EMERGENCY UPDATE|ERROR(256): failed to flash update ifs" message when there is an error when updating software. Disconnect battery negative terminal (or radio power) for one hour or longer. Restore power, disc should read properly and complete update.